Mrs Rogo said she does her work with passion and joy knowing that it is her duty to fulfill in her family. Many have told me to quit being a market vendor and take rest because my husband already operates a taxi business, I tell them that I am here not for the greed of money but to fulfill my role as a great helper to my husband and a supportive mother to my children and grandchildren. These were the sentiments shared by 59-year-old Suva Market Vendor Livia Rogo when interviewed by the Fiji Sun yesterday. 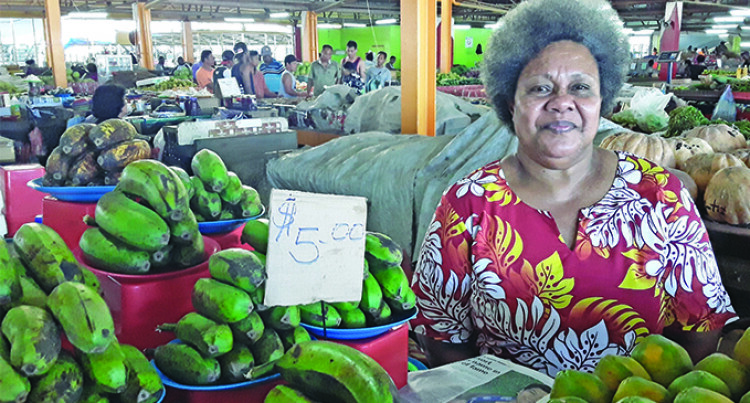 The Nabuli, Dreketi, Rewa native says that being a market vendor has taught her to be patient and to have a heart that perseveres through the easy and the tough moments. “I have a hectic schedule everyday, I wake up at four every morning and I prepare for the day that is ahead of me,” Mrs Rogo said. “I start each day with a prayer, I dedicate my day and all that I plan to do unto the Lord because I know my strength comes from him alone,” she said. “I love the work that I do everyday, I do it with joy and passion because I know at the end of the day, I am fulfilling my role as a wife and a mother. I never complain when it gets hard but I have always learnt to be grateful in whatever circumstance. “My husband and my children look after our taxi and car business and every earning is saved for family use. She said she has established a relationship of trust with other market vendors and she enjoys her time at the market. “I make sure I come to the market every morning with a clean and good heart.